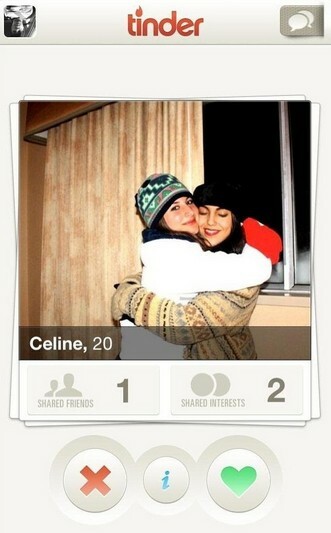 The Tinder dating app is one of the hottest new apps around for dating. The app was launched in September 2012, and has since grown exponentially. Currently the growth equals around 5% per day, which makes it one of the most rapidly growing apps currently in the App Store and on Google Play. The Tinder dating app does over 3 million successful matches each day. The app currently has over 2 million users that log in every day. Tinder focuses on men and women between the ages of 18-35, capping the age limit at 50. The Tinder dating app does not use the default way of getting to know each other. You get introduced to the profile picture of local persons, which you can like or dislike. Think back to hot or not folks. If you like the picture, and the other person likes your picture as well, you will be matched. It’s really that simple. You will subsequently be able to chat with each other and meet up if you decide to do so. Not rocket science. what the screen looks like as you browse. The use of Tinder is free of charge. Of course that will change at some point either by introducing more advertising within the tinder dating app or by making it a subscription based service. Also you may want to check out Hinge dating app. While it is not yet available in all cites the matchmaking algorithm is said to be more advanced. Details on that here. The CEO of Tinder currently is Sean Rad. The company is based in Los Angeles, California. They cannot be reached by telephone, but can be reached via email through help@gotinder.com. Tinder is a great and innovative way of finding new potential love partners. Nevertheless we feel that the app currently focuses a lot on first impressions, since the only matchmaking system is based on profile pictures. First impressions however do count, so we do not see any reason not to jump on the band wagon! Prefer something more established with more members? Try the largest dating site in America free with this trial offer. Also check out our complete mobile dating app reviews here.